Ambience perfume. 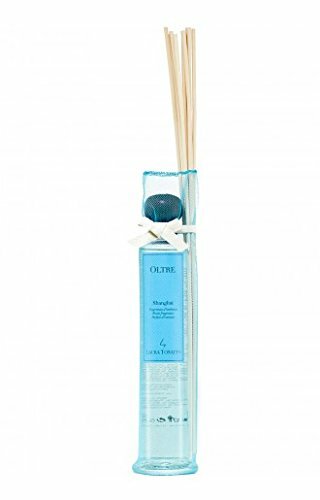 Little sticks of rattan or bamboo have been perfected to absorb and diffuse the scents. The intensity of the perfume can be modified by dipping more or less sticks into the scent and also by turning them upside down whenever diffusion seems to lessen. Avoid exposing directly to sources of heat and air conditioners, which can alter the fragrance and accelerate the period of evaporation. Fragrance: OLTRE A breath of the ocean. Looking straight ahead at the endless water expanse of the Indian Ocean, Alexander the Great closed his eyes, bowed his head slightly and wept. Behind him, his fate, glory and dreams. Before him, only the sea, which lives again in the fresh notes of this perfume. Shanghai 200 and 500 ml capsules are sealed with a particular wax, that prevents contact with air and keeps the product safe. Does not contain dyes, parabens, petrolatum or silicones. If you have any questions about this product by Laura Tonatto, contact us by completing and submitting the form below. If you are looking for a specif part number, please include it with your message.